I did this workout with my Boot Camp class yesterday, and it's a challenging but fun workout that can easily be adapted for home. You'll need two dice, a pair of dumbbells and a mat. We did a 5 minute warm up, followed by round 1 (exercises 1-6 in blue marker) for 12 minutes, round 2 for 12 minutes (in red), and round 3 for 12 minutes (in green), followed by 5 minutes of stretching for a total 45 minute workout. You can adjust the length of time you do each round to fit your desired workout time. Roll two dice, the first number picks the exercise, and the second picks the number of reps. Note the x5 on the top of the board--the number on the dice was multiplied by 5 to decide the number of reps. For example, if you roll a 4 and a 2, you would perform exercise #4, lunges, for 10 reps. 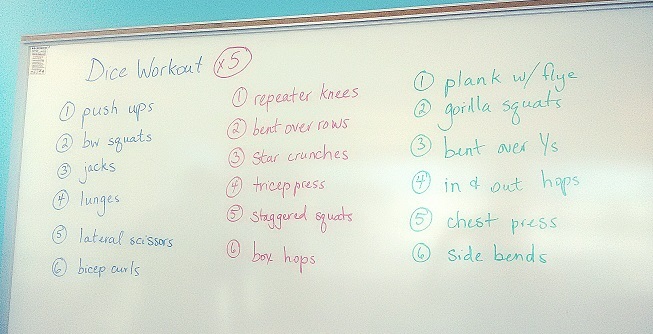 If the number of reps is high, like 30, divide the exercise into 2 sets of 15 with a 10s rest between.